Ranked #8 by TaxTalent, the Edward S. Ageno School of Business delivers a 123-unit Bachelor of Science in Accounting for Golden Gate University undergrads to learn the field’s generally accepted principles in San Francisco or online courses like Cost Analysis. Chaired by Dr. Jeffrey Yergler, the Bachelor of Science in Business capitalizes on a 9:1 student-faculty ratio for engaged, hybrid 123-credit management training in 11 concentrations, including Accounting and Finance. Online or accelerated to 12 months, the Master of Accountancy offers a 45-unit, CPA-aligned “Big Four” curriculum concentrated in Forensic Accounting, Internal Auditing, Taxation, or Management Accounting. The 45-unit Master of Science in Finance admits cohorts averaging 14 into Corporate Finance or Investment Management tracks for upper-level jobs at Google, Morgan McKinely, Stanford Health, CellMark, and more. In San Francisco or Seattle, the Braden School’s Master of Science in Taxation has a fixed 30-unit, nine-month schedule starting each July. Satisfying CFP certification, the 30-unit Master of Science in Financial Planning integrates real-life practicum into online seminars, such as Derivative Markets and Retirement Portfolios, with a 68,000 alumni network. Golden Gate University originated on November 1, 1881, when the Sutter Street YMCA started an all-male Night School with short-term certificates like bookkeeping. Two decades later, it relocated to Nob Hill’s Ellis Street and became the YMCA Evening Law School for an inaugural class of four. In 1908, a Bachelor of Commercial Science was launched with accounting courses. On June 1, 1910, it was formally incorporated as the Young Men’s Christian Association Law College. Renamed again as Golden Gate College in 1923, it acquired the current Mission District home the next Spring. Provisionally accredited in 1956, Golden Gate developed the Doctor of Jurisprudence in December 1967. During the 1960s, PricewaterhouseCoopers partner James E. Hammond served on its Board of Trustees. 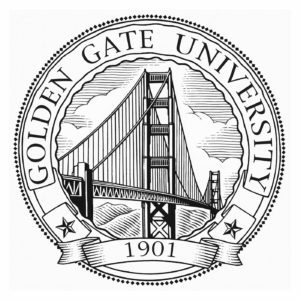 By 1972, the Golden Gate University name was adopted to signal the broad post-grad pathways. Endowed for $59.9 million, GGU now engages 1,937 Griffins from 37 nations at an average age of 35 on-site and online. Washington Monthly crowned Golden Gate America’s #1 best institution for returning adults. College Factual also placed GGU 390th nationally for business administration degrees. On February 18, 2011, Golden Gate University received an official reaffirmation letter from the Western Association of Schools and Colleges (WASC) Senior College and University Commission to renew the Level V accreditation for 10 years under its ninth president, Dr. David J. Fike, who received the 1995 Kellogg National Leadership Fellowship. Headquartered 14 miles southwest via Interstate 880 in Alameda, this nifty nine-territory Pacific accreditor is authorized by the U.S. Secretary of Education to review the academic standards of GGU’s one associate, 20 baccalaureate, 34 master’s, two doctoral, and 28 certificate options. In April 2018, Golden Gate received an accreditation warning from the American Bar Association (ABA). It’s also accredited by the American Association of Law Schools (AALS), but GGU doesn’t have any business-related approvals. Getting into Golden Gate University is labeled “moderately difficult” by Peterson’s because only 66.4 percent of the 435 Fall 2017 applicants were triumphant. First-year Griffins seeking a Bachelor of Science in Business major must culminate a high school diploma, earn the GED certificate, or pass the CHSPE exam. Since Summer 2012, international students requiring F-1 visas haven’t been allowed as undergrads. Standard college-prep curriculum with four years of English and three years of Math is preferred. A maximum of 30 Advanced Placement units graded “3” or higher are counted. Formal major declaration happens after finishing 12+ college units with cumulative GPAs above 2.0. The Edward S. Ageno School of Business seeks master’s entrants with accredited four-year baccalaureates and 2+ years of full-time experience. Completing the BUS 201 prerequisite titled Fundamentals of U.S. Business is mandated. On average, admitted Master of Accountancy and Master of Finance cohorts hold a 3.0 GPA and 500 GMAT score. Achieving at least 4.5 on the Analytical Writing section is necessary. Testing waivers are reserved for managers with five years of experience or valid CPA licensure. Golden Gate University forgoes deadlines to consider all qualified candidates until 15 business days before each term start. However, the priority dates for international post-grads meeting the 550 TOEFL minimum are February 28th, June 28th, November 6th, March 1st, and June 25th. Interested students easily use the Ellucian Recruit portal to submit the $40 Undergraduate or $65 Graduate Application online. Printable PDF forms plus verified transcripts could be mailed to 536 Mission Street in San Francisco, CA 94015. Submit official exam results via the Educational Testing Service code 4329. Additional items include the business résumé, letter of recommendation, personal statement of purpose, certification of finances, and waiver requests. Please contact the Office of Enrollment Services at (415) 442-7800 or info@ggu.edu for more. For 2018-19, Golden Gate University is billing Bachelor of Science in Accounting and Bachelor of Science in Business majors $660 per unit. Each three-unit, lower-level course is $1,980. Undergrads pay the $85 technology fee, $12 ProctorU fee, $100 commencement fee, and $150 business core exam fee. GGU budgets $13,200 for off-campus San Francisco living, $1,920 for textbooks, and $4,610 for miscellaneous supplies. Annual bachelor’s attendance is around $35,825 independently or $22,625 at home. The Master of Accountancy charges $1,050 per unit or $47,250 total. Online MBA cohorts in Accounting or Finance pay $3,150 per course, which equals $56,700. The Bruce F. Braden School of Taxation costs slightly more at $1,200 per unit for an MST price of $36,000. Choosing the Taxation LLM boosts tuition to $1,750 per unit. The Doctor of Business Administration is the biggest expense at $4,700 each course. According to the NCES College Navigator, the Office of Financial Aid on the HUB 1st Floor gets 59 percent of GGU Griffins earning median assistance of $3,071 for $2.28 million combined. Institutional funds include the Charles Bell Scholarship, Bita Darybari Scholarship, William Enderlein Endowed Scholarship, Gurmehar Foundation Scholarship, Handlery Endowed Scholarship, Z.M. Giles Huguenot Scholarship, Masud Mehran Endowed Fellowship, Lois Myers Endowed Scholarship, Nagel Miner Scholarship, Robert J. Shaw Scholarship, and Tritasavit Accounting Scholarship. The Associate Degree Transfer Program allows discounted $5,400 for the Bachelor of Science in Business. Fifteen EMBA Corporate Fellows with 5+ years of experience claim over $30,000. Golden Gate’s Community Tuition Assistance Grant deducts 40 percent off for the immediate family of full-time staff. Federal Pell and FSEOG Grant eligibility is judged by FAFSA forms coded 001205. College Factual records average debt of $40,032 from Federal Perkins, Stafford, and Graduate Plus loans. Locals also have a March 2nd deadline for the Cal Grant and Transfer Entitlement Award. Keep reading about Golden Gate University at the Edward S. Ageno School of Business website.